Flexible courses for those with busy lives. Life too busy for a college course? Why not study something you love. Lingfield Equine Distance Learning courses offer the flexibility to fit your course around your family, work , horse /riding. You don’t have to attend fixed time classroom courses. You can work at home in your own time. Fit your studies around your life. Personal tutor on call for every student. No term times and no fixed completion dates to worry about. Take as long as you like to complete if you wish. You can even take a break if life gets hectic, pick up your course again when things settle down. “I just wanted to drop a note to say how very impressed I am with the course thus far. The first Study Pack has been so interesting, and even after attending or a whole year at college – apparently studying the same course, I’ve learnt so much more in this one module than I ever did in a whole year at the college” Stacey from Norfolk. 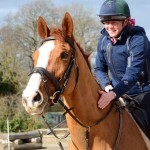 We offer Novice to Advanced horse courses and have a booklet explaining how you can gain qualifications by training part time and work with horses on a professional basis or ring the office to ask for advice. Horse management courses based on the BHS professional Stages 1-3 are the Equine Care & Management courses.